Enlio is a professional manufacturer of Sports Floorings in China. Our products are divided into PVC Sports Floorings, PP Interlocking Floorings, Kindergarte Floorings, Dance/Gym Floorings, Rubber Floorings and Antislip Interlocking Mats. ENLIO Badminton PVC Sports Flooring provides great comfort in absorbing shock and rebounding. It can protect the players from being hurt. It`s the best choice for both general and professional use. Enlio Sports integrated with research & development, produce, sales, installation and after-sales service. We are a professional manufacturer of Sports Floorings in China. 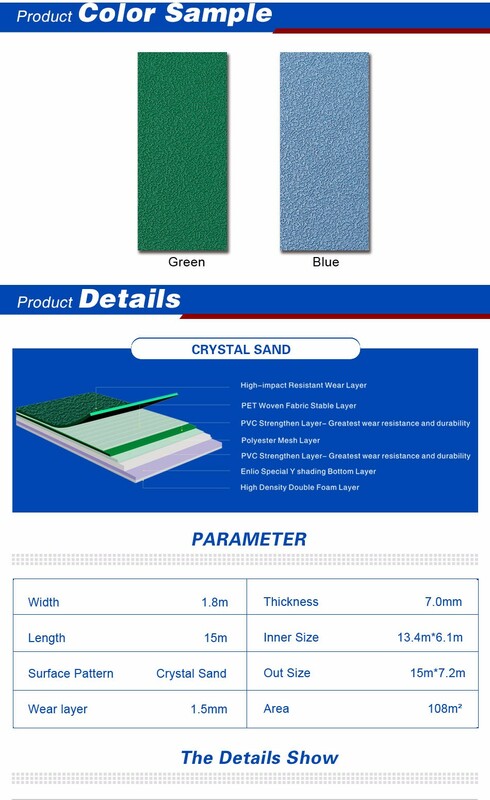 Our products are divided into PVC Sports Floorings, PP Interlocking Floorings, Kindergarte Floorings, Dance/Gym Floorings, Rubber Floorings and Antislip Interlocking Mats. Our products have approved by BWF, ITF, ITTF, ISO 9001, ISO14001, CE, SGS, Fireproof Certificate. Got agreement with CBA on our Wood Grain Flooring. In another word, our wood color flooring can meet the requirement of international basketball competitions. Company Profile Shijiazhuang Enlio Sports Goods Co., Ltd., located in Shijiazhuang, is a leading plastic sports floor making company. Our company integrates the manufacture, sale and after-sales services. In 2006, on the basis of original Taiwan technology, we developed PVC sports flooring by applying the metal-rolling production line from Germany. Our annual production capability is 5,000,000 square meters. At the same time, we also provide high-qualify OEM services for many brands.